In reality, most fuels consist of a combination of heptane, octane, a handful of other alkanes, plus additives including detergents, and possibly oxygenators such as MTBE (methyl tert-butyl ether) or ethanol/methanol. These compounds all alter the stoichiometric ratio, with most of the additives pushing the ratio downward (oxygenators bring extra oxygen to the combustion event in liquid form that is released at time of combustions; for MTBE-laden fuel, a stoichiometric ratio can be as low as 14.1:1). Vehicles using an oxygen sensor(s) or other feedback-loop to control fuel to air ratios (usually by controlling fuel volume) will usually compensate automatically for this change in the fuel's stoichiometric rate by measuring the exhaust gas composition, while vehicles without such controls (such as most motorcycles until recently, and cars predating the mid-1980s) may have difficulties running certain boutique blends of fuels (esp. winter fuels used in some areas) and may need to be rejetted (or otherwise have the fueling ratios altered) to compensate for special boutique fuel mixes. Vehicles using oxygen sensors enable the air-fuel ratio to be monitored by an air fuel ratio meter. In theory a stoichiometric mixture has just enough air to completely burn the available fuel. In practice this is never quite achieved, due primarily to the very short time available in an internal combustion engine for each combustion cycle. Most of the combustion process completes in approximately 4-5 milliseconds at an engine speed of 6000 rpm. This is the time that elapses from when the spark is fired until the burning of the fuel air mix is essentially complete after some 80 degrees of crankshaft rotation. A stoichiometric mixture unfortunately burns very hot and can damage engine components if the engine is placed under high load at this fuel air mixture. Due to the high temperatures at this mixture, detonation of the fuel air mix shortly after maximum cylinder pressure is possible under high load (referred to as knocking or pinging). Detonation can cause serious engine damage as the uncontrolled burning of the fuel air mix can create very high pressures in the cylinder. As a consequence stoichiometric mixtures are only used under light load conditions. For acceleration and high load conditions, a richer mixture (lower air-fuel ratio) is used to produce cooler combustion products and thereby prevent detonation and overheating of the cylinder head. In addition to the ignition timing, the other aspect of vehicle tuning that is most commonly addressed is the fuel delivery. The amount of fuel being sent into the combustion chambers is commonly measured as an "air / fuel ratio" which is just like it sounds - a number representing the ratio of the amount of air to the amount of fuel being burned in the engine. An internal combustion engine mixes fuel with oxygen in the air and then ignites that mixture with a spark plug. From a strictly scientific point of view, the optimum mixture of air and common gasoline is around 14.6 parts of air to every one part of fuel for an air/fuel ratio of 14.6:1. At this ratio and under the right conditions, all of the gasoline and all of the oxygen can burn leaving nothing except for the combustion products. This is called the "stochiometric" ratio. It is just like the ratio of 2:1 for hydrogen and oxygen, as when they react (or burn) in that ratio and under the right conditions, everything is used up and only water (or H2O) is left. Fortunately for us, the oxygen in the air is never completely used up when gasoline is burned. The main reason for this is the fact that air is only 20% oxygen, and the remaining 80% is comprised of things that will interfere with a perfect reaction. If one were to mix gasoline with pure oxygen, the stochiometric ratio would be approximately 3:1 and the reaction would be entirely more dramatic with a much greater chance of a "complete burn." Since there is always some oxygen left in the exhaust gas stream of a running engine, we have an easy way of measuring the air/fuel ratio. An "oxygen sensor" can be used to measure the percentage of oxygen left in the gas stream, and a computer or other electronic device can be used to back-calculate the air/fuel ratio that will result in that particular oxygen percentage. "Narrow-band" oxygen sensors respond with a voltage output that is sent to the computer that is between 0 and 1 volt. "Wide-band" oxygen sensors send a 0 to 5 volt signal which allows for a much higher resolution and are therefore much better for tuning. "Lambda" is a commonly used term that is used in place of the air/fuel ratio number, as many devices use or report lambda values. A lambda of 1.0 is equal to the stochiometric ratio (14.6:1 for air/gasoline) and is adjusted accordingly - a lambda of 0.82 equals a 12:1 air/fuel ratio. The "best" air/fuel ratio for a particular vehicle is a matter of great debate and I will do my best to avoid that debate in this article. Simply put, there are a number of factors that one must consider in determining the best ratio, including power, safety, and fuel economy. Fuel economy is the easiest to understand, as a lower air/fuel ratio means more fuel and obviously lower fuel economy. As far as safety is concerned, richer is considered safer (to a point) as the extra fuel helps things run cooler. The lower temperatures help reduce the chance of auto-ignition and can literally keep engine components from melting. The safest air/fuel ratios are continuously being debated, but it is widely accepted that 13:1 is a good ratio for normally aspirated engines and 12:1 is good for forced induction engines. Many choose to go even richer, even 11.5:1. Auto-ignition (or "detonation" or "knocking") is considered a critical concern with rotary engines, and many tuners choose to go even richer than that. 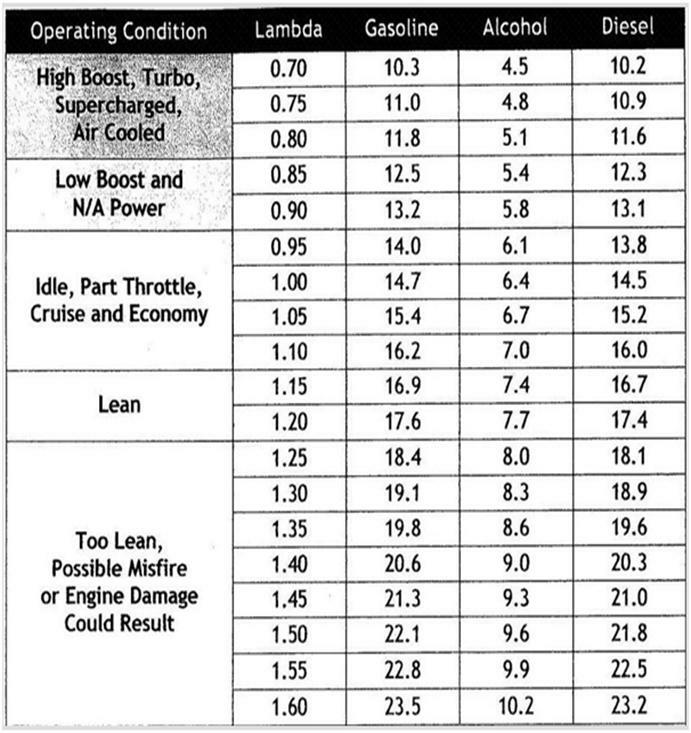 One must also keep in mind that these "safe" ratios are considered safe because they have been tried with many thousands of vehicles over many years by dyno operators that use the same equipment that most people are likely to encounter. Therefore, a safety margin that takes into account the accuracy of that equipment is inherently factored in. If it were common for turbocharged cars to blow up at 12:1 as measured on commonly used equipment, then the "safe" air/fuel ratio would have been lowered. As far as power is concerned, I'll say only this: Every vehicle is different. 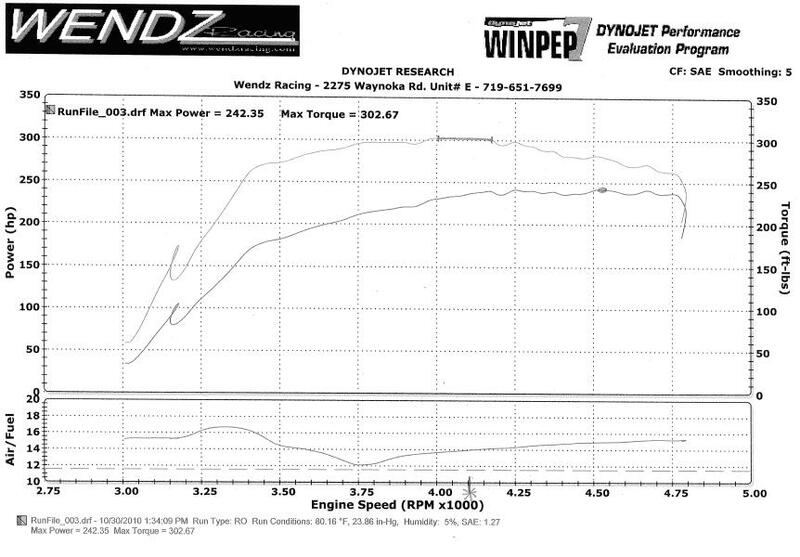 If one wants to find the best air/fuel ratio for generating power, one should put the vehicle on a dyno and test it. Many believe that a particular ratio will result in the most power under any circumstances, and that belief is just too narrow-minded. There are far too many factors involved to make such blanket statements.